Could you face peeling off a layer of skin to look younger? A chemical solution is applied to the skin to give a deep exfoliation. This solution encourages the damaged upper layer of skin to peel away, revealing new, revitalised skin underneath. What skin concerns do they treat? Peels are an effective way to treat skin concerns such as signs of ageing, discolouration and UV damage and are used to correct and reduce conditions such as pigmentation, uneven texture, lines and wrinkles. As well as the face, chemical peels can be used on other areas of the body such as the neck and hands to not only reverse skin problems but to increase the overall health of the skin. What skin peels does Elegant Aesthetic offer? The Perfect Peel® transforms your skin to make you look younger, healthier and clearer in just one week. It can be used on all skin types and requires no pre-peel skin preparation. The process takes less than 15 minutes and is virtually pain-free. ZO® 3-Step Peel™ offers anti-ageing benefits and is an exfoliating peel used to repair skin texture and correct pigmentation. It is great for many skin conditions such as acne, sun damage, uneven skin tone, lines and wrinkles. There are three levels of peel intensity; superficial, medium and deep. The intensity of the peel will be determined by the results you want to see, the downtime you can afford to take and the level of irritation you can tolerate. Chemical skin peels are safe to use, make sure you visit a well-respected clinic to have your treatment. 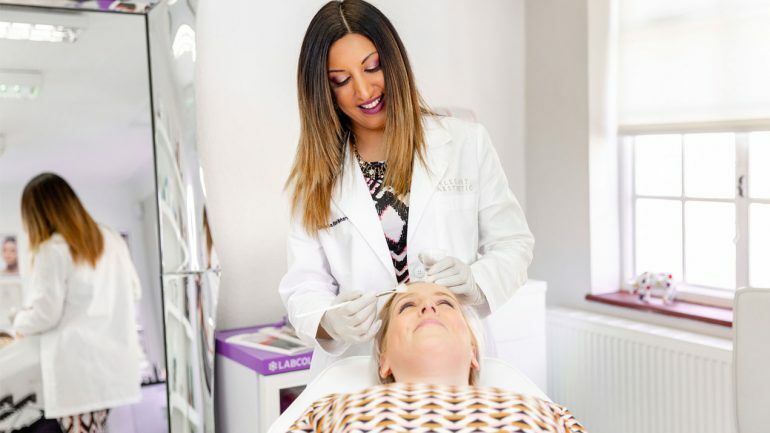 Shikha will never provide treatment without a full consultation first, book yours today (it’s free!) to discuss which skin peel would best suit you and your skin concerns. I am a highly experienced aesthetics pharmacist and have a number of years training under the world renowned Dr. Katie Goldie in Harley Street, London and Dr Tim Pearce at Skin Viva, Manchester. I have therefore decided to base my own clinic in my home town of Bournemouth at the Sandbanks Clinic in Poole’. What makes Elegant different to other clinics is that as a conscientious practitioner I will want to understand your aims and expectations and together come to a joint treatment plan. This is proven to give much more natural, longer lasting results than a “one size fits all” approach to Botox and fillers. I only use the most advanced techniques and products in my consultations including the well established Botox and Juverderm ranges. I look forward to welcoming you into the clinic and begin our journey together to revealing the more Elegant you. SPECIAL OFFER: Get 20% off all skin peel treatments with code ‘SKIN20’.